These look heavenly. Great job Olga! Olga, I think the true measure of a good cook is the ability to buy something you know how to make because you've found something as good that requires no work. My secret is pita bread from a very small Mom and Pop bakery in my area. Your cookies look fantastic. Are we accepting wagers on the ribbon today? Great job on your challenge and the milanos look absolutely yum. 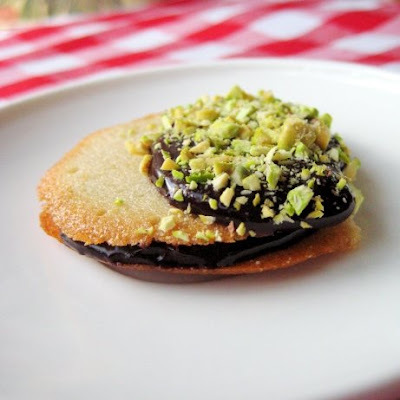 I love the addition of more chocolate and pistachios. Lovely and beautiful pics too. I love these - you did an awesome job on them. Yummy! Gorgeous job! Love the ribbion! These look SO good. 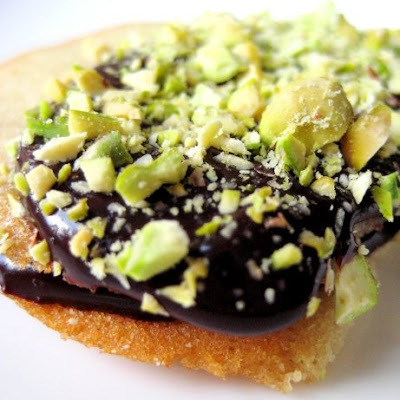 Of course I have been seeing them all over the net as they are part of that baking challenge, but i dont think anyone else used pistachio (which is defintiely one of my favorites). I am tempted to make them now too. 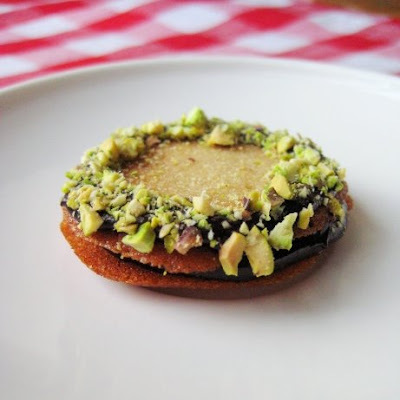 I like the idea of doing them with pistachios. They look so pretty with the green ribbon! Yum, pistachios!! That looks delicious! Olga, as usual, you outdid yourself, hut I don't think there is any limit with your talent! 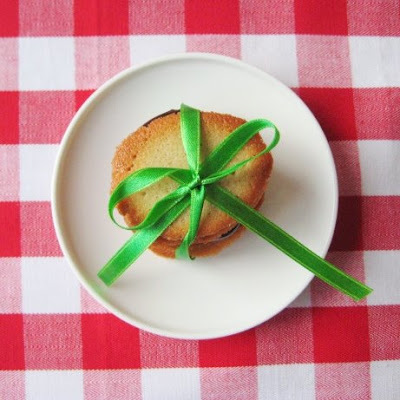 Love the pistachio and the photos, especially with the cookies tied in a green ribbon! Outstanding! These cookies look amazing! I love all the different ways you decorated them. 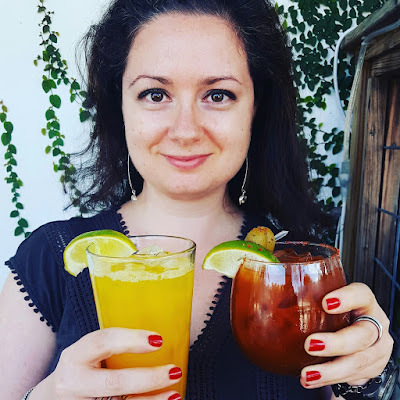 I just joined Daring Bakers and I'm looking forward to seeing what's in store! Beautiful creation Olga! Liking the first photo. It's very cute! I love the pistachio dipped ones! Great job on these cookies. 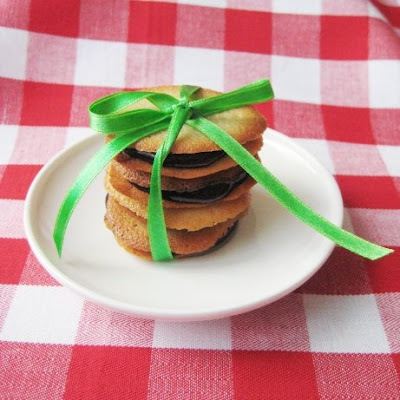 Your cookies look great, especially the pistachio ones! Gorgeous! I love the pistachio ones, soo beautiful! Yum - Your cookies look amazingly good!! I love the pistachios =D. Awesome job on this challenge! Great photos! I love the pistachios too, they look yummy! I have to make this ASAP! Love the pistachios! 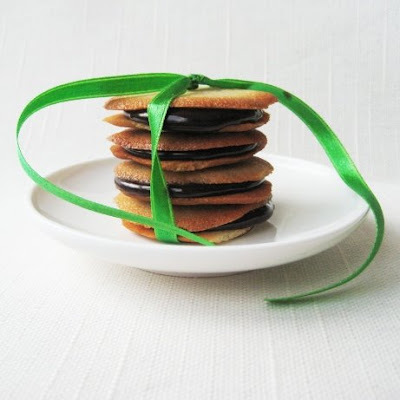 I love the pistachio idea, and the stacks of thin cookies are so cute! Olga, I making attemp to write a cooking book about yiddishe food. I would like to use some of the recipes on a blog. I would greately appreciate your help. 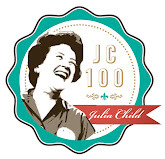 My email is alla4you@yahoo.com and my blog "Cooking with yiddishe mama". Wonderful job! I love all of the variations you made and the pistachio coating is so beautiful! 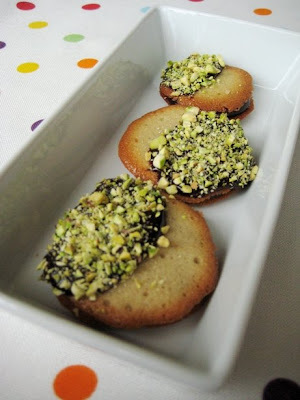 The cookies looked extra yummy with the pistachios in them!! Oh gosh those look soo good! Awesome presentation too! Your cookies look terrific. I think my fave are the ones with the pistachio nuts. How pretty! Loved that you used pistachios,mmm they must have tasted so good! I could see how terrific it is to add chopped pistachio on milan cookies. Made me drool already! You definitely have done a fantastic job on this challenge! You have excelled at this challenge! My mouth is begging for some! These look beautiful! I love Milanos. I've sometimes wondered if I could make something similar at home... once I get some free time, I'm going to be trying this recipe. 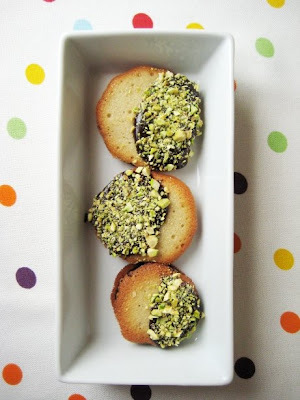 I love that you decorated the Milans with pistachios and the ribbon and chocolate swirls look great! 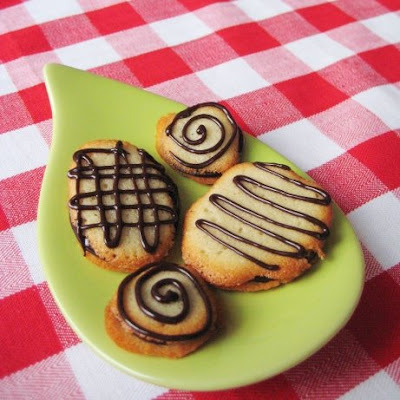 The pistachios look gorgeous on the cookies! I bet they delicious, too. I love how you doubled the recipe for the filling! MMMmmm! They look so good with the pistachios. I wish I had time to make them as well. Love the cookies and the photos!